When black or brown spots just seem to appear on cats' lips, nose, and eye margins, especially on aging orange-colored cats, cat owners have a tendency to worry. What are they and should you worry? The short answer is no—they may look ominous, but they are harmless. Why Do Orange Cats Have Black Spots? The most common reason for these dark spots is lentigo simplex, a genetic condition that is most common in orange tabby, calico, flame point, and tortoiseshell cats. Most often the spots (lentigines) appear in middle-aged to older cats, but they can begin appearing in cats as young as 1 year of age. Owners usually notice the small, dark spots on the lips or nose first, only to worry as more dots appear and some grow a bit larger. Most cats have a single lesion or a handful of lesions, which is characteristic of lentigo simplex; others may have a great number of lesions, which is characteristic of lentigo profusa. If your cat is prone to freckling, expect more lentigo lesions as he or she ages. Small lesions of 1 millimeter or less may appear close together, discoloring a larger area of up to 10 millimeters. The lesions are flat, are not painful or itchy, and do not have any associated redness or other discoloration. If your cat has them on the face, he or she likely has them elsewhere as well, for instance, on the eyelids or the roof of the mouth. The spots are the result of the pigment-producing cells called melanocytes making more melanin than the surrounding skin. 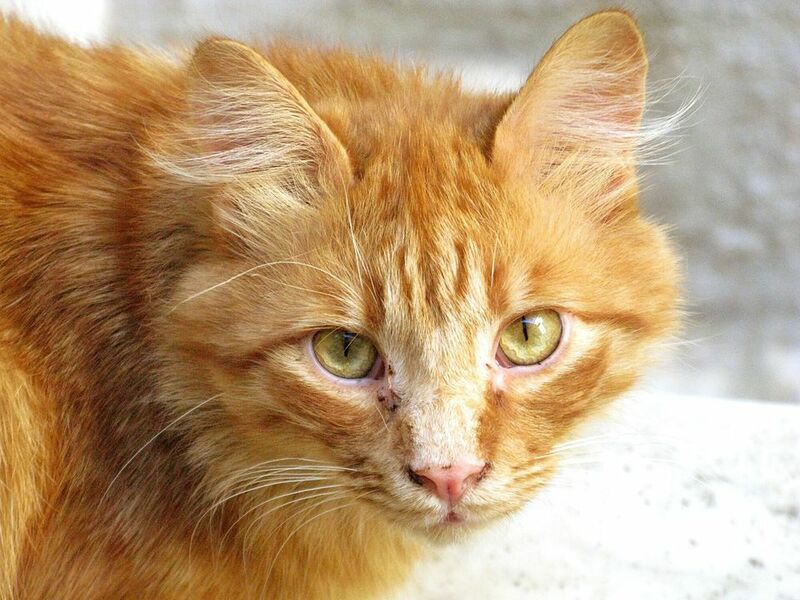 No one knows why some cats have the genetic predisposition for lentigo, but it does seem to afflict cats with orange coloration more than others. Cream- and silver-colored cats also occasionally have lentigo. Rest assured: Lentigo is not a form of cancer, nor do lentigo spots advance to become melanomas. Lentigo is, in fact, completely harmless, like human freckles, and no medical treatment is necessary for the condition. That said, one cannot assume that every dark spot on your pet is harmless; this is just the most common scenario; lentigo can mask some melanomas, and raised darkened spots are more likely to be cancerous than flat spots. Have your cat checked out by your veterinarian to be sure. It is always wise to check out any new finding with your veterinarian to rule out something serious, especially if the spots are at all raised, inflamed, or causing your pet discomfort. There are many conditions of the nose and lips that are more serious. Your vet can provide a hands-on exam to guide your pet's care. While lentigo is not a medical concern, cats do develop melanomas (skin cancers), and it's important to know when a black spot is more than a "cat freckle." The most common form of melanoma in a cat (though it's still rare) occurs in the iris (the colored part of the eye). Such tumors can look like dark patches on the iris, and usually occur in one rather than both eyes. While spots on the iris can be signs of cancer, they can also be benign; only your vet can make a qualified judgment on that issue. In addition to melanomas, cats can also develop tumors in their organs, some of which can be cancerous. While rare, they are often deadly. Typically, a cancerous growth will be accompanied by other symptoms such as lethargy, drooling, or lack of appetite—but this is not always the case. If you're concerned about a lump or bump, or about your cat's overall health, a visit to the vet is in order.